30th October 2018 remains a memorable day for the men and women of a small village barely 100 kms from the capital of Jharkhand, Ranchi. On that day, armed with new knowledge they sat across the table with the Block Medical Officer to demand healthcare services particularly for 4 pregnant women, 10 lactating mothers and 10 children below 3 years of age. “We gained knowledge about the health services provided by the government health system from videos shown by Parvati Devi (Community Mobilizer) in the anganwadi centre,” shared Dulari Devi, who has just delivered a child. She was able to get 2 Antenatal Check-ups (ANC) since the Anganwadi Nurse Midwife (ANM) resumed the services in Shijhua village, Tatijharia block of Hazaribagh district in Jharkhand. The village now has regular Village Health & Nutrition Days (VHNDs) with an ANM in attendance, 2 beneficiaries have registered, services like scheduled check-ups during pregnancy, TT vaccine and distribution of IFA is now regular. The village has had 2 cases of Institutional delivery and 10 children have received immunization during the last quarter. Digital Green’s Project Samvad, funded by USAID seeks to improve knowledge and awareness about health and nutrition among pregnant and lactating women and children under 2 years of age as well as the full range of family planning methods among the rural agrarian communities of 6 states in India, including Jharkhand. Digital Green is working with MKSP PIA-Srijan , a local NGO in the Hazaribagh district of Jharkhand, that has been supporting the implementation of the Samvad project on the ground since July 2018. The project blends health and nutrition messages with agriculture messages through community videos. For example, the nutri-garden intervention which is promoted to ensure the community is growing their own fruits and vegetables in their backyard using the wastewater and other materials to irrigate and create compost. This ensures they get the necessary nutrition through a diverse diet. The community is also shown videos about services that the government health systems provide and the importance of availing those services, thus motivating them to further demand those services. This project is being implemented in 35 villages of Ichak and Tatijharia Block of Hazaribagh district in Jharkhand. In the neighbouring Shayalkala village of Ichak block, a hamlet, named Mammarak had never been visited by an ANM or received any government health services. The community lacked awareness on health issues. When videos of Project Samvad were disseminated in the hamlet community members started paying closer attention to the information shared. “Very recently a family in our village had lost a mother and child immediately after delivery. After watching the videos, we understood that this had happened due to lack of proper care during pregnancy,” shared Baby Devi, who has watched all videos shown in the hamlet since the project intervention began. 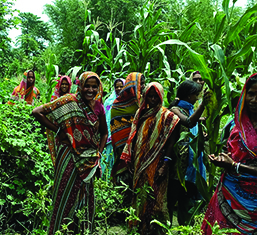 The Community Mobilizer (CM), Chanda Devi, who mediates the video dissemination encourages a diverse and healthy discussion at the end of the video to gauge the grasp of the video among the community members and motivates them to identify any gaps in the supply of service and demand for it. 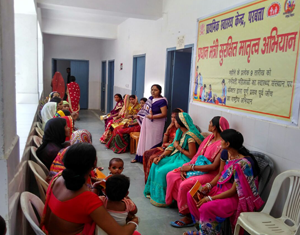 “After watching the videos under project Samvad, the community members understood the importance of the best practices promoted including Diet Diversity During Pregnancy, Importance of ANC checkups, Danger Signs During Pregnancy, IFA tablet etc. and met with the Mukhiya (village head) to discuss the gaps they had identified,” shared Chanda Devi. The Mukhiya further wrote to the Block Medical Officer requesting that the Village Health and Nutrition Days (VHNDs) be started and held regularly in their hamlet too. “The Mukhiya too started attending every video dissemination along with the Ward Member (local elected representative) and motivates the community to avail the facility being rendered during the VHNDs,” adds Chanda Devi. Read how India's national program providing quality maternal care services is providing a great platform for SBCC. 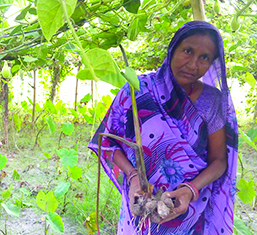 Kinu Yadav, is a local hero and inspiration for farmers in and around Dumaria village, Muraliganj block of Madhepura district, Bihar. 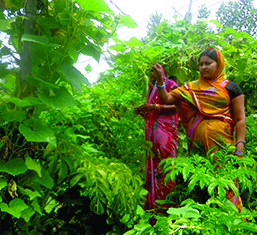 The story of Usha and Reena - two sisters who were inspired by videos to work on their kitchen garden and are now themselves an inspiration. Somia Devi is proud that women of the village now consider her a role model and people come to learn from her through the videos.